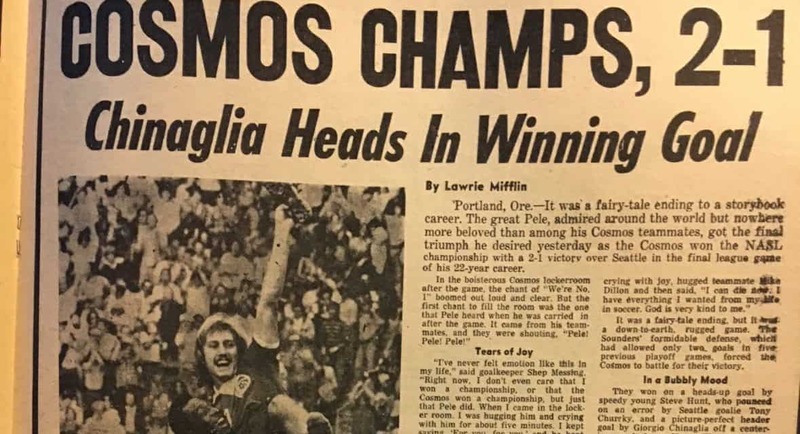 Here’s the headline and photo of the New York Daily News that proclaimed the Cosmos 1977 NASL champions. HEMPSTEAD, N.Y. — The iconic photo ran in just about every important New York metropolitan newspaper 39 years ago Sunday. Steve Hunt and the rest of his Cosmos teammates were in soccer heaven. Pele had lifted the 21-year-old winger from Birmingham, England up high while Hunt held his left shoe in his hand in a triumphant pose. Some 41 years ago today, Aug. 28, Hunt picked the pocket of a goalkeeper and turned what should have been a routine play into one of the most famous goals in American professional soccer history. Hunt accomplished a lot of things in a 16-year career on both sides of the pond as they say in his native England, but that moment in Soccer Bowl ’77 helped define his career, at least in New York and New Jersey for sure and likely in the rest of the United States. At the time, he was a first-year player on the Cosmos who was eclipsed by legends of the game. Do the names Pele, Franz Beckenbauer, Carlos Alberto and Giorgio Chinaglia sound familiar? That North American Soccer League season was a special time for Hunt for so many reasons. Those aforementioned players and a talented supporting cast made it possible. It also was the Black Pearl’s final season as a professional and the team wanting the greatest soccer player of all time to go out as a champion. The Cosmos went through much tumult that season, which included the sacking of coach Gordon Bradley (Eddie Firmani quit the Tampa Bay Rowdies midway through the season to take over the coaching reins) to the firing of team president Clive Toye, the architect of that team that included the signing of Pele to sellout crowds at old Giants Stadium for the first time to the addition of not one, but two World Cup winning captains in the form of Beckenbauer and Carlos Alberto. The Cosmos rolled through the playoffs, including that unforgettable 8-3 romp over the Fort Lauderdale Strikers before a then USA record soccer crowd of 77,691 at Giants Stadium. They then confronted the Seattle Sounders at Soccer Bowl ’77 was at what is now Providence Park in Portland, Ore. on Aug. 27, 1977. New York was the favorites, but the underdog Sounders were a side filled with English players with a work ethic second to none. Twenty minutes into a scoreless affair, Chinaglia played a ball down the left wing that Hunt chased with Seattle’s Mel Machin. 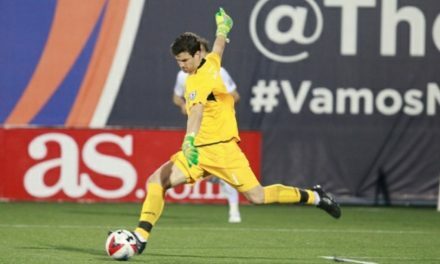 Sounders goalkeeper Tony Chursky, a member of the Canadian national team, came out and smothered the ball. Hunt followed Chursky toward the goal. Chursky, who was deaf in one ear, could not hear the shouts and warnings from his teammates that Hunt was bearing down on him. The Englishman nudged the ball away and he got a step on the goalkeeper. Hunt slipped the ball into the net as Chursky tried to tackle him via American gridiron football style but the ball rolled into the net. Stunned, Chursky was on his knees in the net while the Cosmos and their fans who traveled 3,000 miles across the country went wild. There is an iconic picture of that iconic goal with Pele hugging Hunt, who was holding his left shoe, which was loosened by the goalkeeper during the goal-line tussle. “I got my shoe in my hand because obviously he’s grabbing me around the waist and we fell into the goal and my shoe came off,” Hunt explained. (Machin told the Seattle Times at the time: “We can’t give a team like that goals, can we? It’s their birthday. What a gift goal. I don’t believe it. Tony’s experienced, too, but he’s deaf in one ear and can’t hear a thing I shouted like hell at him. He couldn’t hear me.”). At the time, Hunt realized he did not score a run-of-the-mill type of goal. After he had given the Cosmos a 1-0 lead at 19:05 (the North American Soccer League counted goals via minutes and seconds back in the day), Hunt was wondering if it was a goal. In case you were wondering, Hunt wore PONY soccer shoes at the time. But the company did not promote the fact Hunt scored the goal wearing its soccer boots, so he did not get any money, either. “Damn,” Hunt said, asking a reporter if his voice recorder was still running. “You owe me, guys, you owe me,” he said about the shoe company with a big smile on his face, which elicted laughter from his audience. Hunt was far from finished that afternoon. 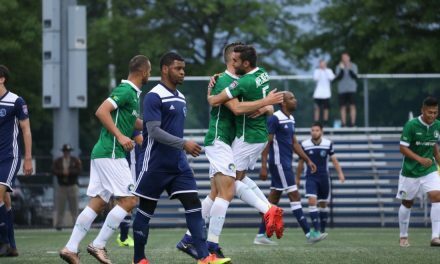 After former Cosmos forward Tommy Ord knotted things up at 1-1 at 23:10, Hunt went into action again. This time he was a goal creator. Chinaglia buried it into the back of the net ay 77:19 and the Cosmos had a 2-1 advantage that they closed out. By scoring the first goal and setting up the game-winner, Hunt was named MVP. He said he received a check of around $1,500 for that honor (it would be about $6,000 today). “Somebody presented with this check that must have a meter long,” he said. “I remember all these people in the locker room and I’m walking around with this. What do I do with this? The Cosmos locker room was “chaos,” Hunt said. It was packed to the gills, with little or space to stand, let alone breath. The Brazilian media took Pele on his shoulders and paraded the legendary striker around the room while singing and chanting his name. It was one surreal experience. “Lockers rooms were chaos with the Cosmos over the years,” Hunt said. “That one was a little bit special because it was history with Pele. 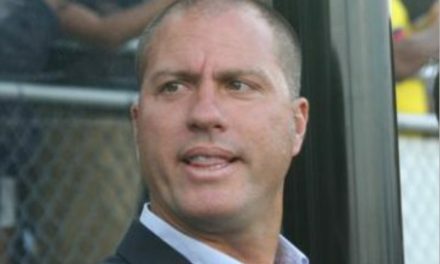 Hunt has been a youth soccer coach for FC Bournemouth, which performs in the English Premier League. He works with youngsters ready to enter the club’s academy. Back in the day, Hunt was one serious competitor. Hunt toiled for the likes of Coventry City, West Bromwich Albion and Aston Villa, for whom he helped regain promotion to the top flight in 1988. That’s when he worked for Leicester City. Yes, the same Leicester City that won the EPL crown as longshots in 2016. Hunt, who admitted he was a “massive fan,” of Bruce Springsteen, decided to put two of his passions together in his latest visit to the states. He celebrated his 60th birthday and his wife bought tickets for both of them. He knows someone with the E Street Band, so he got an opportunity to watch Springsteen at MetLife Stadium not once, but twice that week. Then came the Cosmos game Saturday. Hunt forged some new ones as he did some warm-ups with the team during it training session at Shuart Stadium at Hofstra University in August 2016. He called it “tiring.” Hunt had knee replacement a decade ago. He was just glad to be back with the next generation of Cosmos players who have followed in his and former teammates’ footsteps. 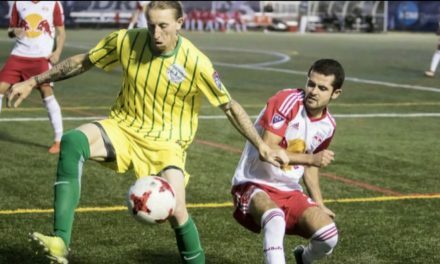 Since returning to competitive soccer in 2013, New York has won two Soccer Bowl titles and is gunning for a third one. While he enjoyed a 16-year pro soccer career, Hunt realized how precious it really can be. You never had to question whether Steve Hunt enjoyed every minute on the soccer pitch.